The English Cocker Spaniel is a spaniel, which is a flushing dog. They search for game birds, which in turn panic when found and appear for the waiting hunter. Once the prey has been shot they will retrieve the birds on command. Their name comes from the birds they most often hunted, the woodcock, moorecook (red grouse), and heathercock (black grouse). The history of the English Cocker Spaniel is entwined with that of the English Springer Spaniel. They both originated in England and in the early stages of development were known as Land Spaniels. These dogs were interbred and then the pups where later assigned different tasks depending on their size, so it was possible for Springing (also known as Hawking or Starter) and Cocking Spaniels to be born in the same litter. In the late 1800s attempts were finally made to formally separate the two sizes into the Springer Spaniel and Cocker Spaniel respectfully. Further confusion faced the Cocker Spaniel part of the split when they were brought to the United States and some began breeding for different traits, more for a companion and show rather than a gundog. 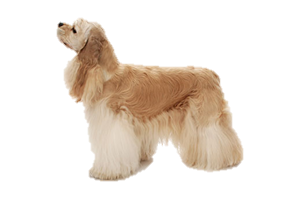 Eventually the differences became so great that in order to preserve both types two separate breeds were recognized, the American Cocker Spaniel and English Cocker Spaniel. In either homeland they are known simply as the Cocker Spaniel.